Congratulations rolled in from around the world for France's football team on Sunday after their young side triumphed over Croatia 4-2 in an incredible World Cup final in Moscow. French President Emmanuel Macron simply said "MERCI" (thank you) to the football team on Twitter after the match. Government spokesman Benjamin Griveaux called the team "GIANTS". "Twenty years later, thank you Les Bleus for giving the dream to a new generation," Griveaux tweeted, referring to the country's only previous win in 1998. France's far-right leader Marine Le Pen tweeted: "Bravo to the French team! It's done!!!!! Bravo (coach) Didier Deschamps and all his players. HISTORIC!" Croatian Prime Minister Andrej Plenkovic, who wore the team's jersey as he watched the match with fans in the capital Zagreb, said "these boys are world champions for us". "They taught us about heart and unity. We lived through a fantastic and unforgettable period for the whole of Croatia during this month. This is shining like gold," he told local channel NOVA TV. "The whole world knows now about our country. They (the team) can be an inspiration to us in all spheres of public life." Russian President Vladimir Putin said his country could be "proud" of its hosting of the World Cup, judging it a success "in every respect". "We can surely be proud of how we organised this tournament," Putin said in televised comments after the final. "We have made this grand event a success in every respect," he said, adding that foreign visitors holding "fan ID" cards for the World Cup could have visa-free entry to Russia for the rest of 2018. "We have made this grand event a success in every respect." Russian Prime Minister Dmitry Medvedev wrote on Instagram: "A marvellous final! France are champions. Russia has organised the best World Cup." US President Donald Trump quickly congratulated France and praised his Russian counterpart Vladimir Putin on the eve of the Helsinki summit between the two leaders. "Congratulations to France, who played extraordinary soccer, on winning the 2018 World Cup," Trump tweeted. "Additionally, congratulations to President Putin and Russia for putting on a truly great World Cup Tournament -- one of the best ever!" Canadian Prime Minister Justin Trudeau sent his best wishes on Twitter in French as well as English. "Congratulations Les Bleus! What a victory for France at the #WorldCupFinal. Great tournament and a great young team." He added: "Towel off and celebrate @EmmanuelMacron!" 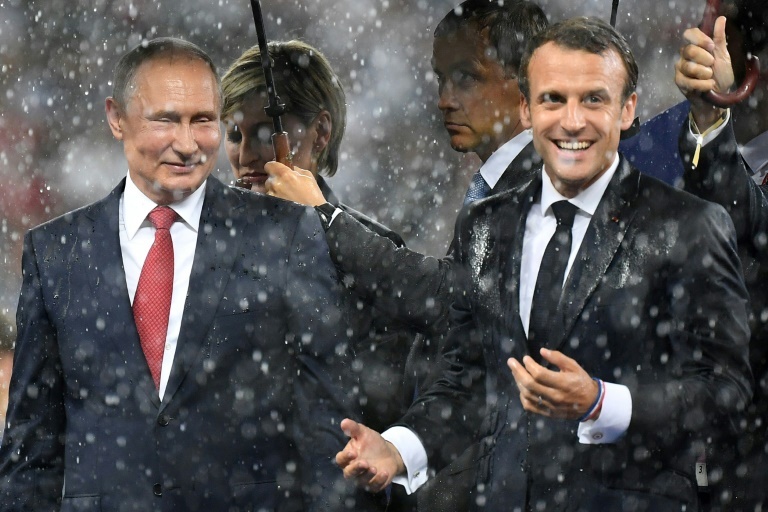 -- in reference to the torrential rain that fell just after the match ended, as Macron was congratulating the team on the pitch. German Chancellor Angela Merkel said "Toutes mes felicitations" (all my congratulations) in French, her government spokesman Steffen Seibert tweeted. "Congratulations to @equipedefrance for the World Cup title and second star after a great tournament -- and great respect for #Croatia, a team that never gives up #FRACRO #WorldCupFinal2018". Spanish Prime Minister Pedro Sanchez tweeted "Congratulations France!!" "World champions in a thrilling and intense match with a great rival, Croatia."